Carrie Stevens created three streamer flies in her series of “Devil” patterns. The Blue Devil, White Devil, and Red Devil. All three have the common component of shoulders of “partridge,” meaning ruffed grouse body feathers. Each also has a two-color throat, though the written recipe in the Hilyard Carrie Stevens book for the Red Devil lists only the red hackle fibers, but blue hackle fibers in addition to the red are clearly visible on the sample pattern in the Hilyard Carrie Stevens book, tied by Leslie Hilyard. Red Devil – size #4 – 8x long Gaelic Supreme Martinek / Stevens Rangeley Style streamer hook. Tied and photographed by Don Bastian. 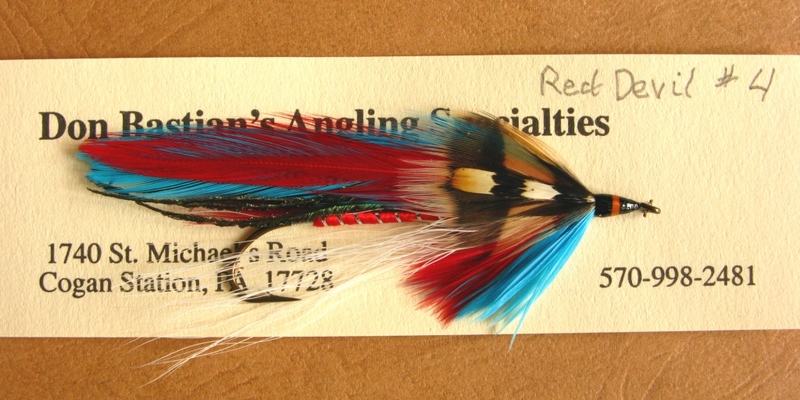 This entry was posted in Carrie Stevens Pattern Dictionary, Fly Pattern Recipes, Streamers and Bucktails and tagged Blue Devil, Carrie Stevens, Red Devil, White Devil. Don, great to see the beautiful flies, and the recipes etc… for Carrie’s flies. I applaud your work here on your blog. What a great thing to do for people. I also love the history behind the flies too. Thanks Kelly! I appreciate your comments and compliments. Glad you like the flies too! I also want to add additional photos to each post of uncarded streamers too. As my tying and time permits. Thanks again for your comments! Large and spectacular collection, I wish I could tie some of them …! someday! But I lack the material and those hooks …! Very, very nice. Thank you for your compliments! I appreciate it very much! The Red Devil is such a strikingly rich color combination that appeals to my eyes! I just have a feeling that a large Brown might agree. Carrie Stevens did so many patterns, most of them I’ve never fished. But I agree with you,I like this color combination and I think most any large salmonid would go for it! Thanks for your comment!